At the end of April this year I ended up in Los Angeles after a weekend exhibiting at WonderCon in Anaheim, California. I was there to record my parts for a rock opera version of my graphic novel Basewood that my friend Andy and I are creating. 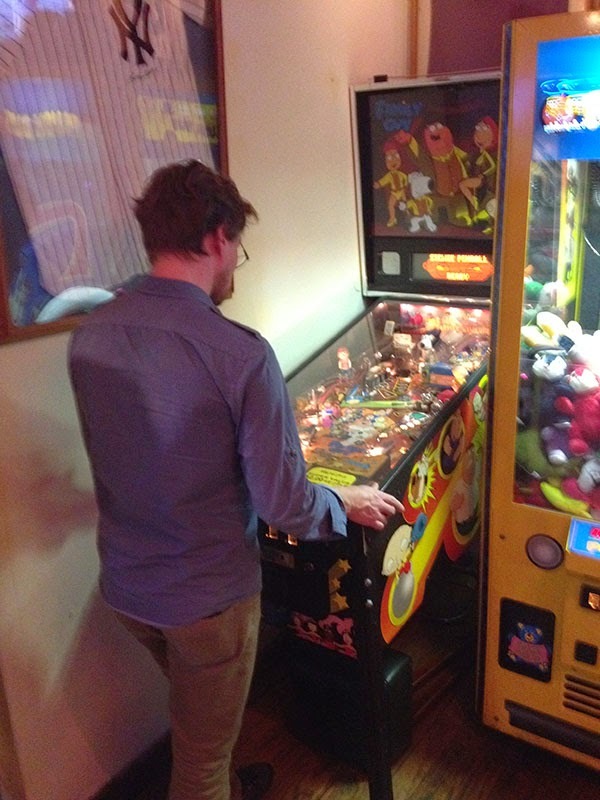 On the night after we wrapped all of my parts, Andy and I hit the town and played some pinball to celebrate. 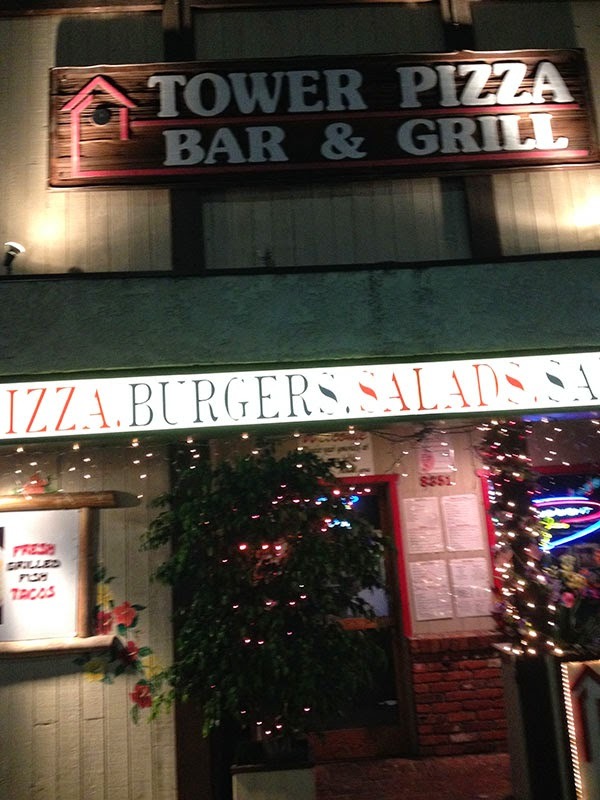 Our first stop was Tower Pizza Bar & Grill. 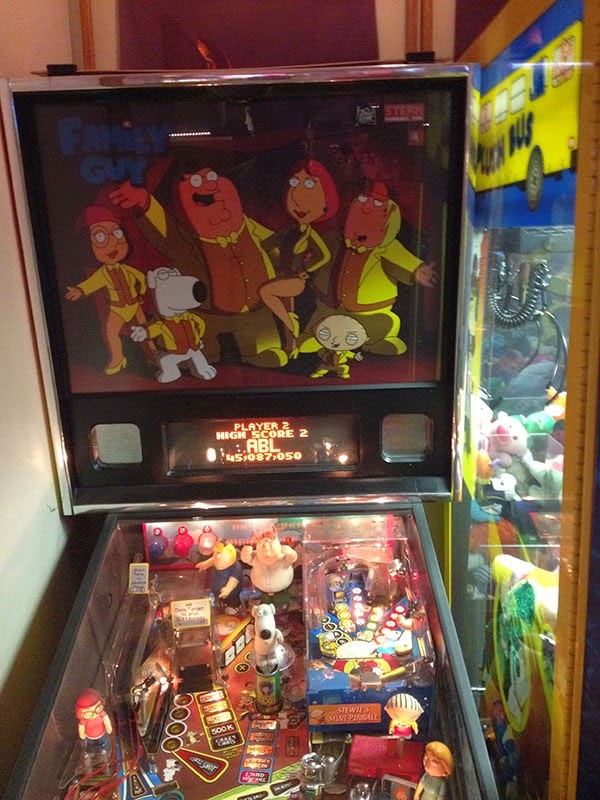 They had a Family Guy machine that was working great, except for one switch in the miniature playfield, which made it impossible to beat that mode. Andy and I had actually warmed up on this machine the night before, but sadly had to leave after only one game because the place was closing. This time we were both getting a lot of replays which was great. I got the #2 score with 45 Million, which felt pretty awesome. Next we headed to AMF Mar Vista Lanes by Andy's house. We had been here once before when there was a Spider-Man, but it had been replaced by a Lord of the Rings. The left flipper was in the process of dying, but I still felt like this was the most satisfying game of LOTR I had ever played. As I mentioned in an earlier post, this is my favorite set-up for playing pinball. Two friends, working together to learn more about a machine. We figured out the mechanics of a lot of the modes, and made sense of the bewildering playfield layout, which has always confused me. It got me excited to play this game again and to get a little deeper into the ruleset, whereas before this, I always avoided this machine because I felt it was too complex. Back when I first got my Medieval Madness pinball machine, I put it in the student lounge area in the Center for Cartoon Studies Senior Studio building. Students dumped their quarters in the machine and we split the proceeds 50/50 with CCS. Their half of the quarters took the form of the April Fog Memorial Pinball Scholarship. But what did I do with my quarters? Well, a lot of laundry... but that's not all! 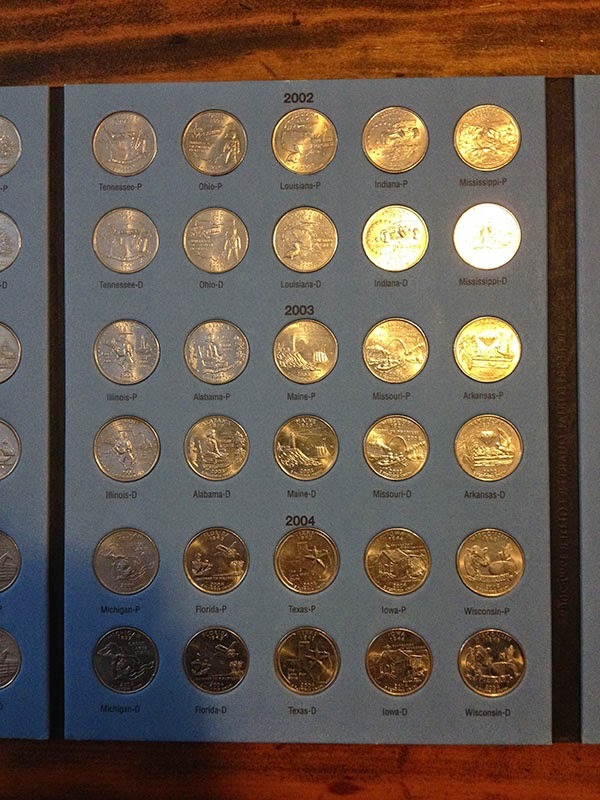 I decided early on that it would be a lot of fun to collect all 50 of the State Quarters that the U.S. Mint has been releasing in recent years. 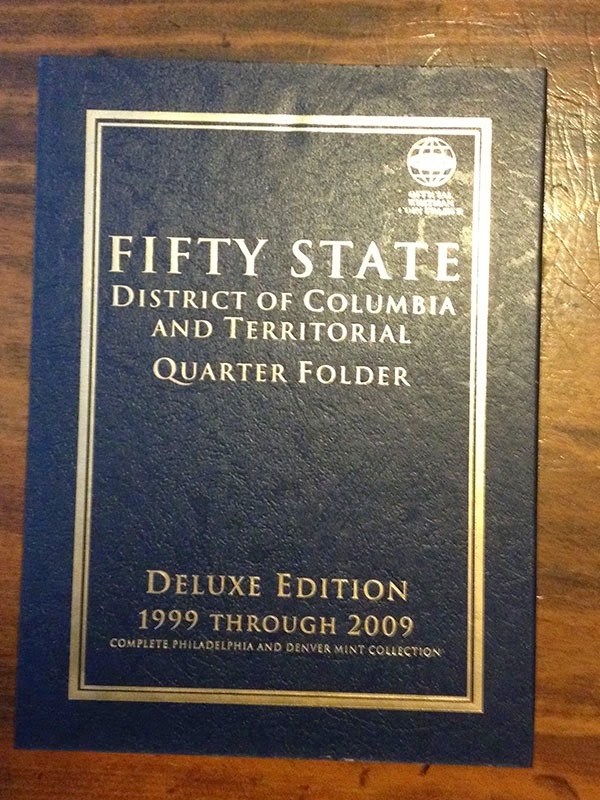 I sent away for a Whitman Coin Collecting Folder, figuring that I should keep them organized. 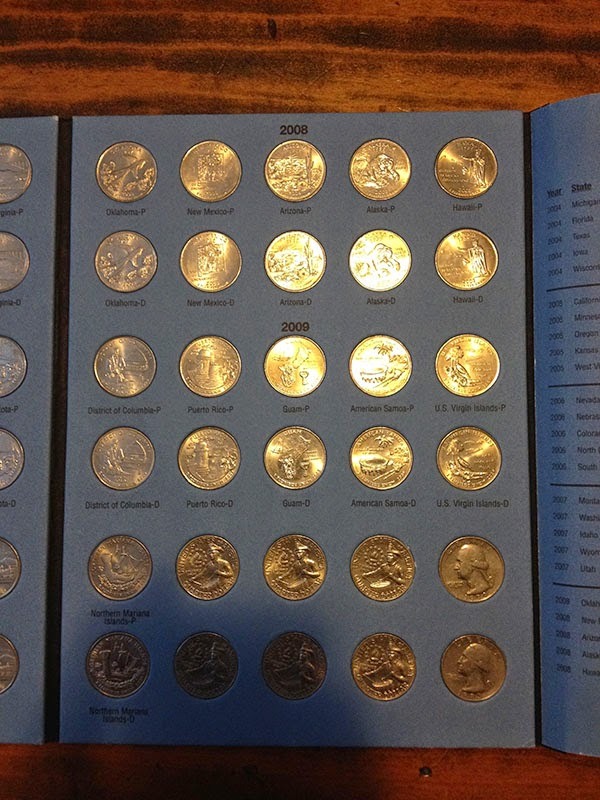 What I didn't realize was that this folder required both versions of each coin - one from the Denver mint (D) and one from the Philadelphia mint (P). Needless to say, it was relatively easy to find (P) coins in Vermont, but a bit harder to find (D) coins that had worked their way across the country from Denver. I was not above filling in gaps with coins I found while traveling out West, and I would say that by the time I left Vermont in 2012 I had about 90% of this folder filled up. Of course, the last 10% was extremely difficult to find! Any time I ever came across any quarters I would double check them - at the arcade, in a shop, doing laundry - anywhere. I made a Google Doc spreadsheet listing the remaining quarters I needed, and I set up "coin agents" around the country to help me find the missing coins. 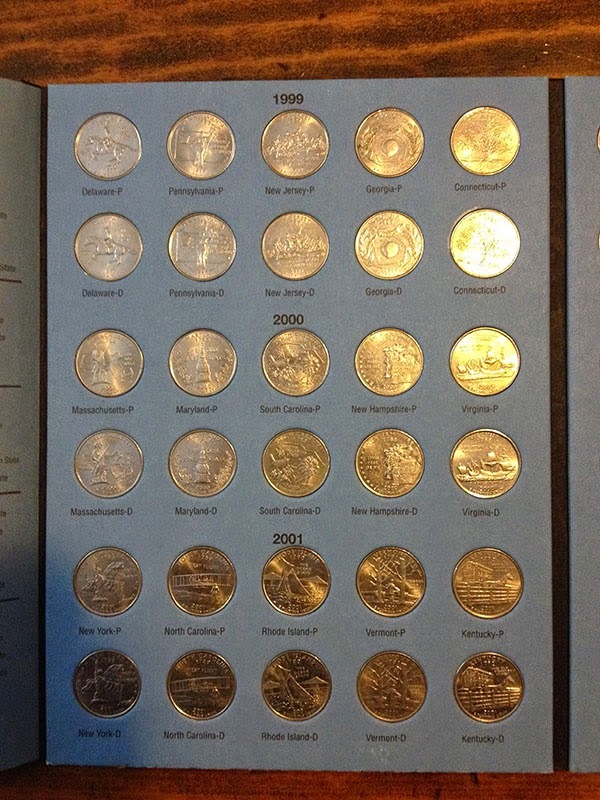 The last one I needed was an elusive 2009 (D) Guam quarter. I finally found it this April in Greg Means's coin jar in his apartment, in Portland Oregon. My collection is now complete! My wife Claire and I filled in the empty slots at end with bicentennial "drummer boy" quarters and one quarter each from our birth years. 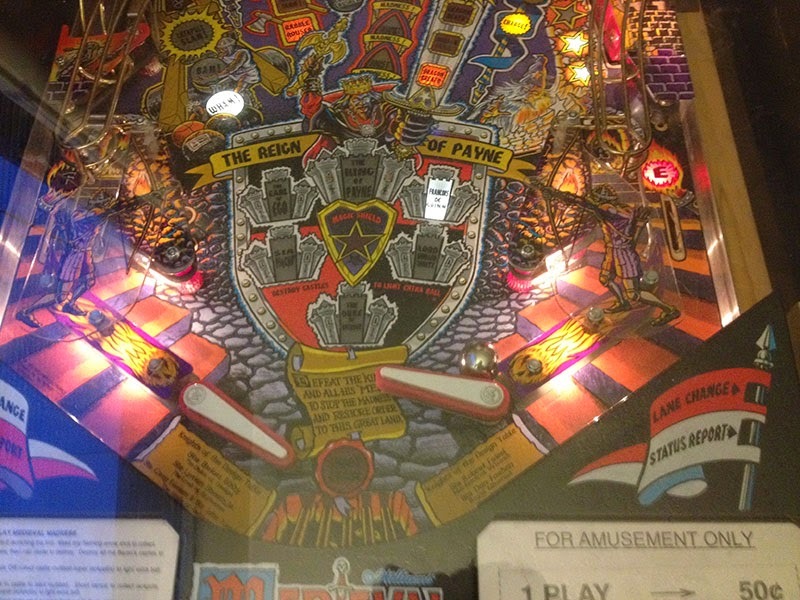 Ironically, my pinball machine no longer accepts quarters, because it's set to Free Play (it's in our living room). 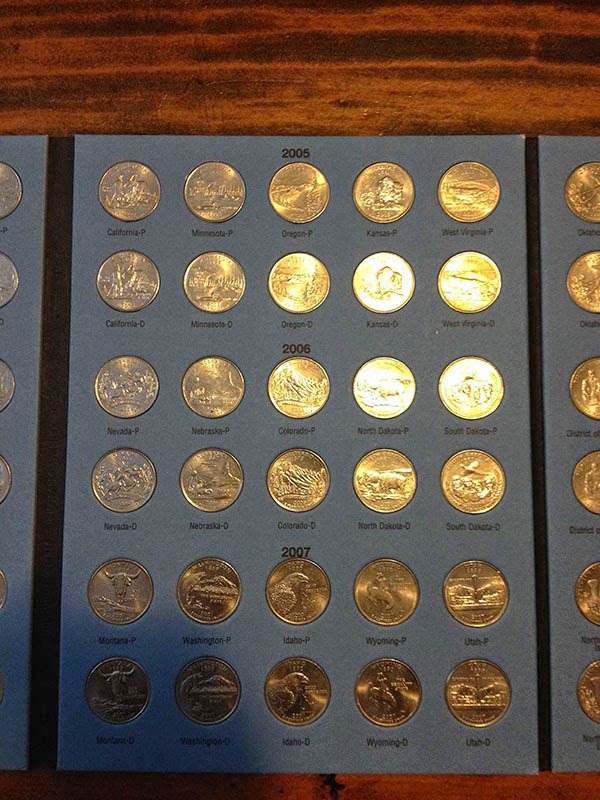 But now my wife and I have coin collecting fever! 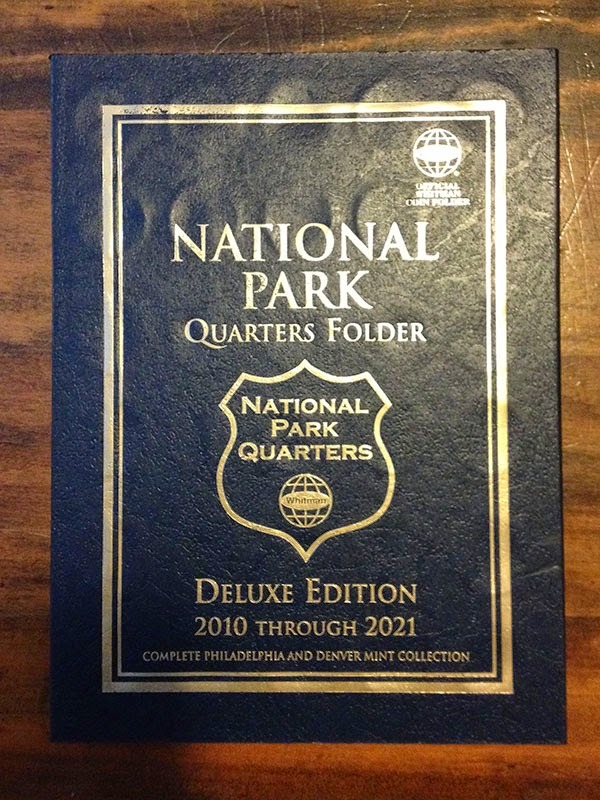 We bought a National Park coin folder, and are dutifully filling it up by obsessively checking every quarter that crosses our path. This one goes all the way through 2021, so I guess we'll be at it for a while! When I left off last week, Elizabeth had taken me around the facility, and showed off the layout, the competition banks, and some of the equipment that the PAPA wizards use to arrange the machines in around. After our initial lap, we went back to the front desk and Elizabeth gave us a cup of tokens to play games with at our own leisure. It was an amazing opportunity. Much to my pleasure, and surprise, I found that the cups were FILLED with tokens that I had designed!?! They were already set up for Pinburgh the next weekend. This was a very surreal moment for me. I was with Josh and Joyana at PAPA HQ, and we decided that the best thing to do was to go around and play 3-player games on each machine that struck our fancy, rotating who gets to decide which machine we try. Here are some of the gems we found while circulating around. The art on these machines was really inspiring. Even though the art on a playfield is still screen-printed today, you can really see that on these older machines. I can see some of the color combinations and tricks that we use on paper printing. These machines have bolder areas of color with broad areas of overlap. It's smart printing with great impact. It reminds me of the feelings that I had when Alec and I were first getting into pinball. The art on the pinball playfield and cabinet was a big deal to me. <- Heh heh, what?? This goblin is the creepiest thing that I've ever seen!!! <- Tattoo Assassins is a Data East game that PAPA high wizard Kevin Martin worked on as an Engineer. This game is a fighting game in the tradition of Street Fighter, or more appropriately, Mortal Combat, complete with 2,196 finishing moves. The game was never released, and two of the five cabinets produced have a home at PAPA. <- Motor Show, made by Mr. Game from Italy. The game looked like nothing to call home about, but what really floored me was the bonkers shape of the cabinet. The legs were made out of plastic, and the cabinet had a plethora of angles. The cherry on the crazy sundae was that the front of the game had two gun-handle-type devices that the player used to control the flippers. That's right, NO FLIPPER BUTTONS. Please, take a look at this profile image HERE for a better look. <- A hold over from Pinburgh 2013. A mini version of the poster I made. Really dreamy to see it under the glass. <- Verily, I can't remember what machine this was, but it was a cops and robber themed machine. The cover to the pop bumper must have broken, and this is what they found to cover it with :) Too funny! <- I thought that Shaq Fu was the only way that I could enjoy Shaq in the gaming realm, but I was happily mistaken. We only had so long in PAPA HQ, so we had to curate which games we played. I love how he has to freakin' crouch down just to get onto the backbox! <- The PAPA Champion gets to wear this badass belt like a wrestler. I barely had the nerve to touch it! Forget about trying it on! THIS IS ONE HONOR THAT ONE EARNS! I wouldn't sully that magnificent belt with my novice waist! <- Another shot of the pinball banners. These ones are from Haunted House, Addams Family, and Fireball. The bulk of games that we played were on the Zaccaria machines. Knowing that I wouldn't get a chance to play them any other place. I'm going to hold off on my thoughts on those games until next week, but I will say that I was NOT disappointed. Other than that, we played games on Black Hole, Haunted House, Roller Disco, Wizard of Oz, the old Spiderman Game, and a couple of others. Josh and Joyana were great sports, and we really had a blast! 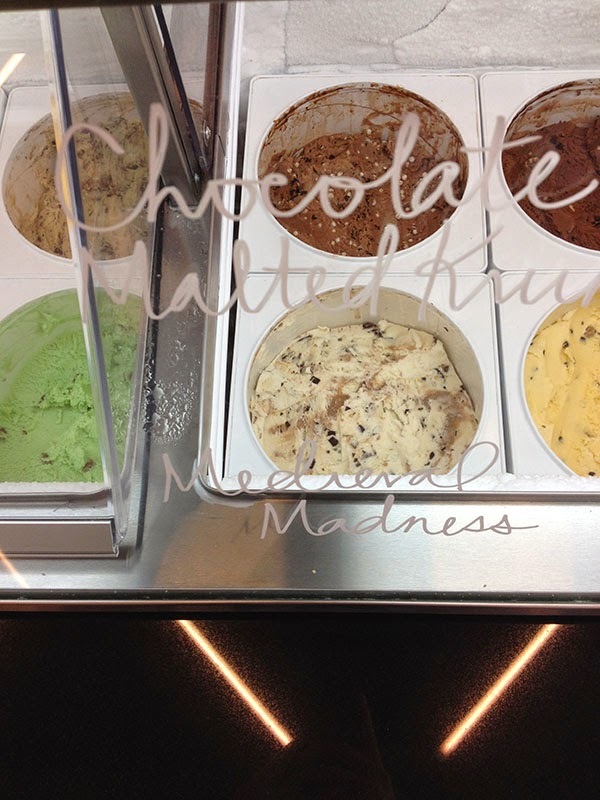 Needless to say, each of the machines we played worked impeccably, and every surface on every machine was spotless. I feel very lucky that Elizabeth took the time out of her day to hang out with us and show us around. She and the other staff members of PAPA work incredibly hard to keep things running smoothly, and bring pinball to players in new and exciting ways. If you are even NEAR Pittsburgh anytime in April or August, see whether it is around when one of the PAPA tournaments is, and plan accordingly. One year later... still on top! This April I was in Portland, Oregon for the inaugural Linework NW festival. While I was in town, I of course, made time to swing by Ground Kontrol to play their Star Wars: Episode One machine. I quickly scrolled through to the high score board, only to find that my high scores from last year were still intact and untouched! This felt pretty awesome. Battling myself! Sadly, I was not able to bump PAT off of the board, or get any new high scores on this trip. Maybe next time! Back in April, I was having a really good game of Medieval Madness. I made it all the way to Battle for the Kingdom, when all of a sudden, my left flipper went up and stayed there. Even though it meant losing my game, I quickly shut off the entire machine. 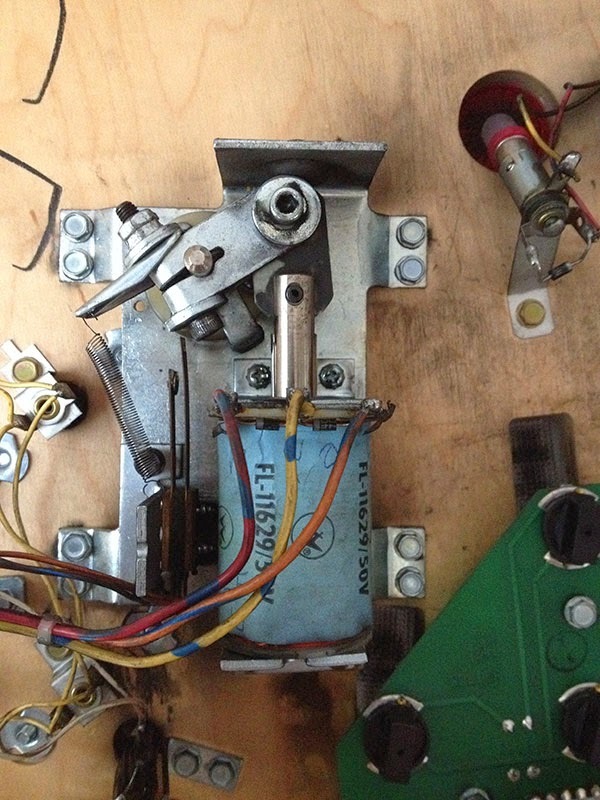 I keep a log of all my pinball repairs. This way I can go back and see when I replaced a part, or leave little notes for myself about how to dismantle things, or fix them, etc. etc. etc. Back in May of 2011 I replaced all of the nylon sleeves on every coil in the machine. This was a great repair for a few reasons: 1) I really got to know the underside of my machine, because I had to remove every single coil 2) it was fairly cheap to get all of the sleeves, but it really made the whole game run a lot more smoothly - I highly recommend this repair if you own a machine! 3) it also helped me catch a few coils that were starting to swell. When a solenoid swells, that means it's getting close to dying, which can lock up the shaft, which can then fry circuits in the backbox. It's bad news! The two coils I found that were in bad shape were the tower diverter and the left flipper. The tower coil had already burned through its paper covering so I replaced it right away. The left flipper seemed okay, so I left it alone and made a note to myself in my repair log to keep an eye on it. So three years later, the coil finally seized up. Luckily I remembered that it was in bad shape and was able to shut the machine off before it fried anything upstairs. I decided to just go whole hog and rebuild both flippers, since I had never done that with this machine. I also ordered some other parts from Marcos to check off some "to-do" items from my repair log. On a day when I was burnt out from traveling, I decided to do all my repairs. It had been a while since I had gone "under the hood." I remember thinking, "Here goes nothing!" The first thing I did was replace the left troll housing. 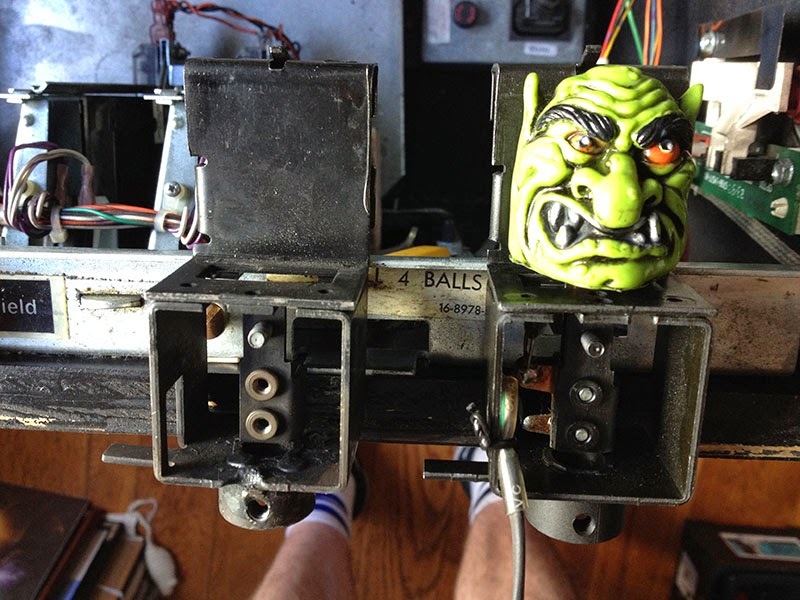 I had to take this off once to fix the switch behind the left troll and it was almost impossible! A previous owner had done some sort of spot weld on the bottom ridge of the bracket, which had messed up the threads in the bottom attachment. It literally took a hammer to get this thing off the solenoid rod! On the right, you can see the new, clean bracket with all the troll hardware moved over. This may seem like a lot of work for something that doesn't get used very often, but I'd rather just have the right part in there, so that future repairs are easier to make. Here you can see the old (dead) flipper coil. This is only one of many pictures that I took, so that I would have some reference when putting the new coil back together. I wanted to make sure all the parts were facing the right direction and that all the wires got soldered back on in the right place. Here is a photo after I replaced the left flipper, but before I replaced the right one. I guess I could have left the right one until it failed, but it seemed like a good idea to just replace them both. It was really cool, I was able to go into the diagnostics and see how many flips each flipper had flipped. 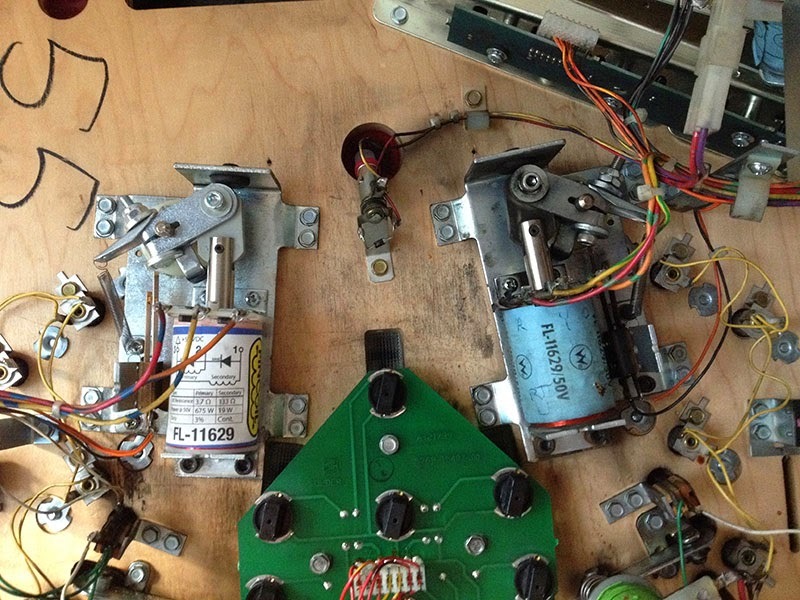 The left flipper had 1,503,993 flips and the right flipper had 840,717. I'm not sure if the flippers had ever been rebuilt. You're supposed to do it every 500,000 flips or so. 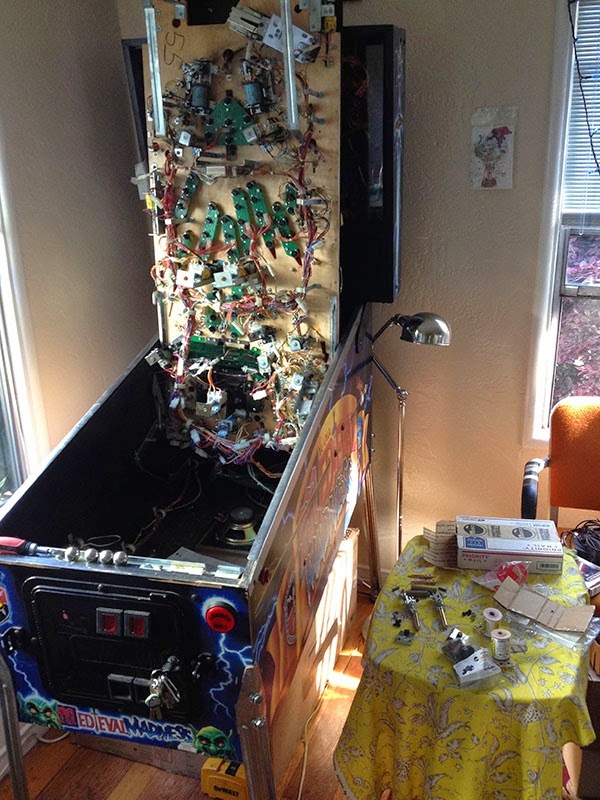 I got the flippers back on and cleaned the playfield. My machine has never played better! As I've posted several times here, I've been collaborating with PAPA to do various shirts, posters, and tokens for some of their events over the past two years. I've really valued the chance to participate, in however small a way, to the amazing events that are going on at PAPA HQ. Last April, I went with my buds, and amazing artists Sophie, Josh, Carl, and Joyana to Pittsburgh, PA while they looked at the city as a potential place to move to. (Spoiler, they're moving there! Get ready for an injection of awesome, Pittsburgh!!) It was a really great trip for me, and I too fell in love with Pittsburgh. 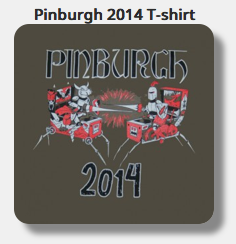 Unfortunately, the trip occurred ONE WEEK before the Pinburgh Championship, so I wouldn't be able to see one of the great pinball tournaments of the US. I decided to shoot an email over to Mark Steinman to see if I could get into the facility. I am so grateful that PAPA wizard Elizabeth Cromwell took the time out of her day to show me around! Here are some of the photos that I took on the initial lap that Elizabeth took me around on. <- The main competition block at the front of the facility. LOOK AT THOSE MASSIVE BANNERS! Each feature some amazing pinball art from classic machines like Creature from the Black Lagoon. I can only imagine what the facility would be like when all the machines are turned on, and full of players! <- To the right of the entrance is an eating area. This also includes all of the non-pinball machines in PAPA HQ. This area also included all of the Zaccaria machines that PAPA had, which is something I've reserved for another post. <- Freak Out, a custom machine by Mike Budai. There were a couple of other different custom machines, but this one was my favorite. Also, the colors on that Black Jack machine in the foreground are breathtaking! <- Elizabeth Cromwell shows off the machine that they use to huff pinball machines around the facility. There are over 400 machines in the space, with more offsite in storage. Also, Surf n' Safari? One of the things that was continually blowing my mind about this visit was how every other machine was something I'd never heard of before. From the Zaccaria machines to obscure Bally machines, this facility is a treasure trove of rare gems. <- Yeah, there's a lot of machine! A. LOT. I'm looking through the photos right now, and I;m realizing that there are a lot more to show/talk about. I'm going to break this up over two weeks! Drop Target at Heroes Con!! I will have some of the first printing of DTZ issues 2, 3, 4, and 5, and some second printings of issues 1 and 4. These are the new versions of the second printing that Alec posted about. 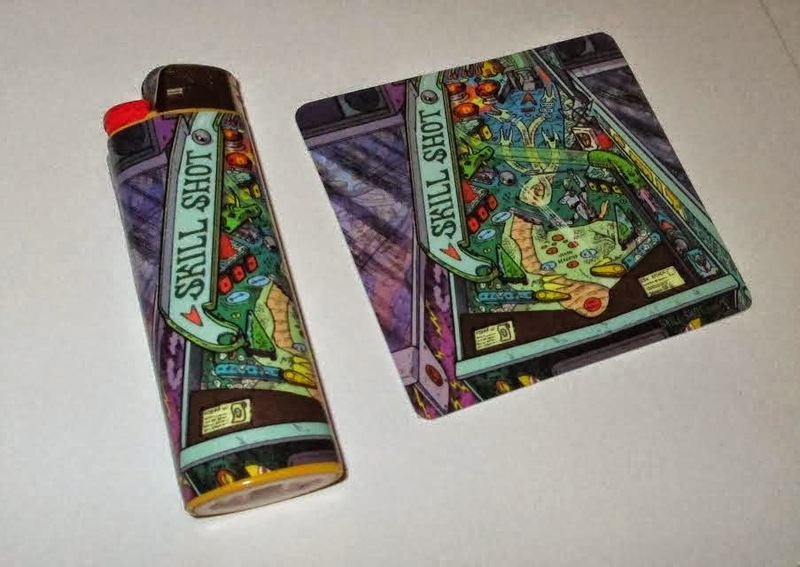 I had the absolute joy to work on a sticker for the Lighter of the Month Club, run by mastermind Jeff Larson (who also runs the amazing Seattle-based pinball zine, Skill Shot). Every year, he likes to do a pinball-themed sticker, and I was happy to oblige : ) I got a bunch of these stickers in exchange for doing the art, and I'll be including them with pretty much everything! As some of you out there in the Pinball Universe might know, I am going to be moving from my lovely HQ in White River Junction, VT to the wonderful Northampton, MA! The next two items that I am selling is in support of trying to lessen the amount of material I have to move. 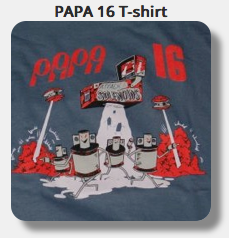 First up is a handful of shirts that I did for various PAPA events. Team, let's take knee, 'cause it's time to get real. 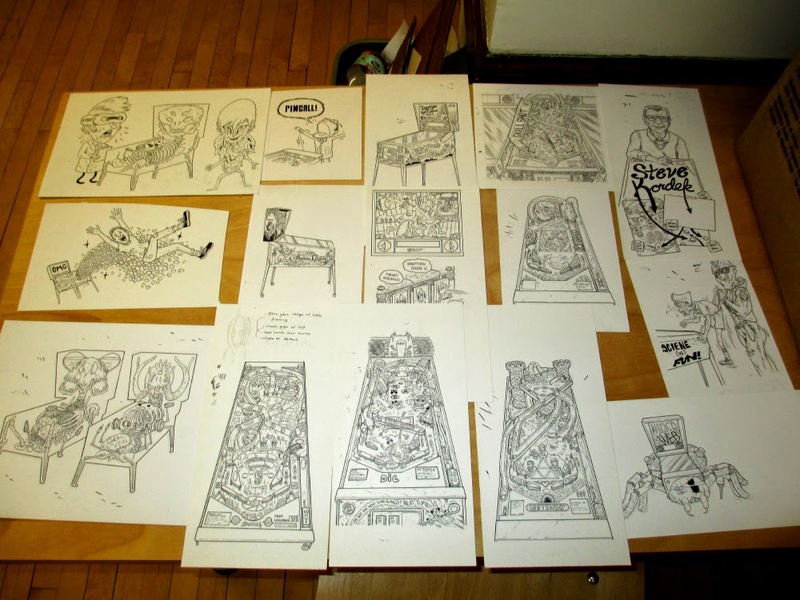 I've been drawing pinball art for, like, 5 years now, and I have quite a backlog. Some of the pieces are near and dear to my heart, but some of it I don't have as much of a connection to. I'll be bringing a bunch of my pinball art to Heroes Con, but I'll be selling a bunch more after. If there is some piece of Jon Chad pinball art that you like, shoot me an email! Phew! Anyway, that's it. If you find yourself in Charlotte, NC, come on by Heroes Con and say hey :) Also, tune in tomorrow to the DTZ blog where I start a multi-week look at my visit to PAPA headquarters! My friends Charlotte and Ed were visiting the bay area back in April, so they swung by Alameda to hang out, meet my new cat and check out my new neighborhood. Believe you me, the highlight of my neighborhood tour is the Pacific Pinball Museum, which is about five blocks from my house. The PPM has about six newer Stern machines in their front lobby, which you can play using quarters. You can also pay $15 to access the rest of the museum and their dozens and dozens or other machines. 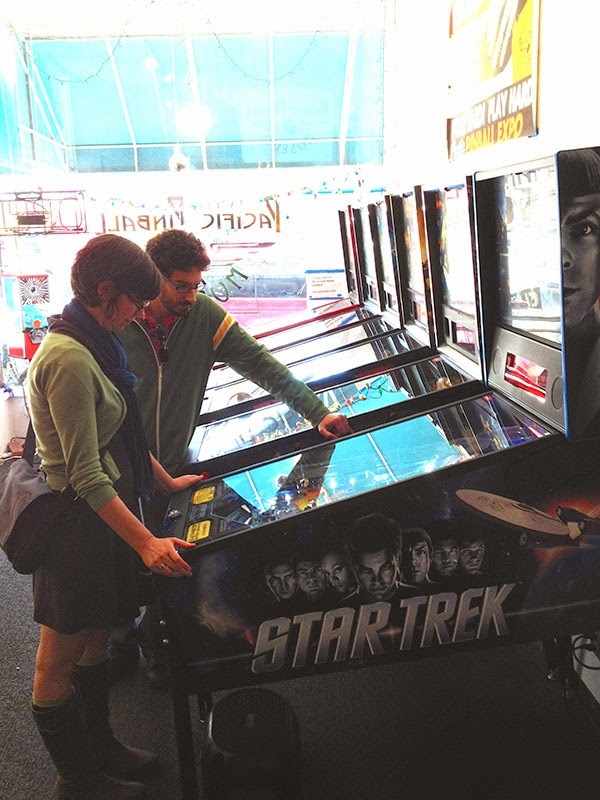 We decided to plunk a couple of bucks into Stern's new Star Trek machine and play a couple of three-player games. I'm coming to realize that this is my favorite way to play pinball. A new, unknown machine, non-competitive friends and a sense of teamwork. We all watched the game carefully, trying to figure out what was required to move deeper into the game. "Look! When you hit those three green standup targets, the lock lit up." Now we knew what to do to get multiball. Etc. etc. etc. This is especially fun with friends because they can read the instructions on the DMD for you, which is hard to do when you are busy trying to make sure the ball doesn't drain! 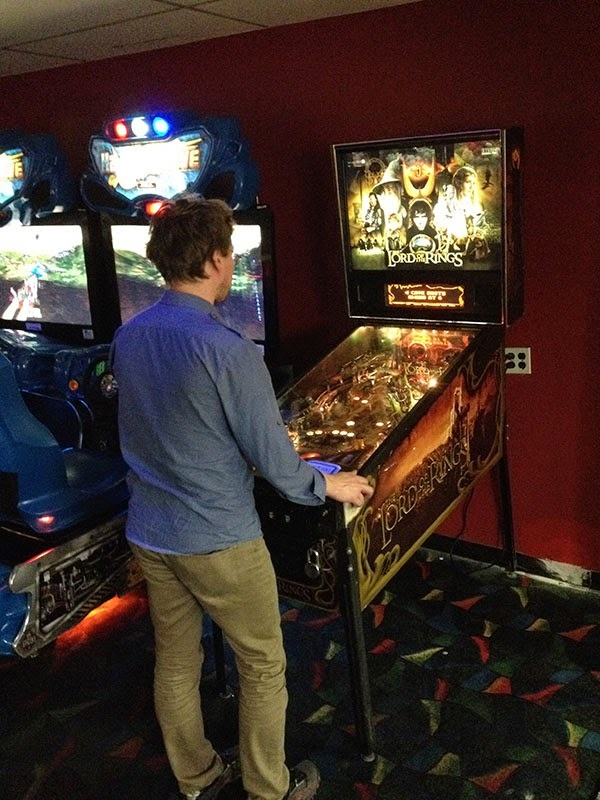 This is how I got into pinball - playing SW:E1 with Jon in Vermont, and I think I prefer this method to just playing on my own, or competing against people. So the point is, I like it here in Alameda! Back in April I passed through Seattle for Emerald City Comic Con. I went out to dinner with my family in the Columbia City neighborhood and then afterwards they took me to Full Tilt Ice Cream. Their front sign says it all: Fresh Ice Cream / Old School Arcade! I felt a bit pressed for time (family waiting) so I just played a two-player game of Creature From the Black Lagoon with my father (neither of us could get the multiball) and then I played a solo game of Jurassic Park. The "A" switch was not working, making it impossible to start modes, so it was kind of a fruitless game, but I was happy to add another great locations to my list of Seattle pinhalls. I will definitely play here again! New Zine on the block! Slam Tilt! 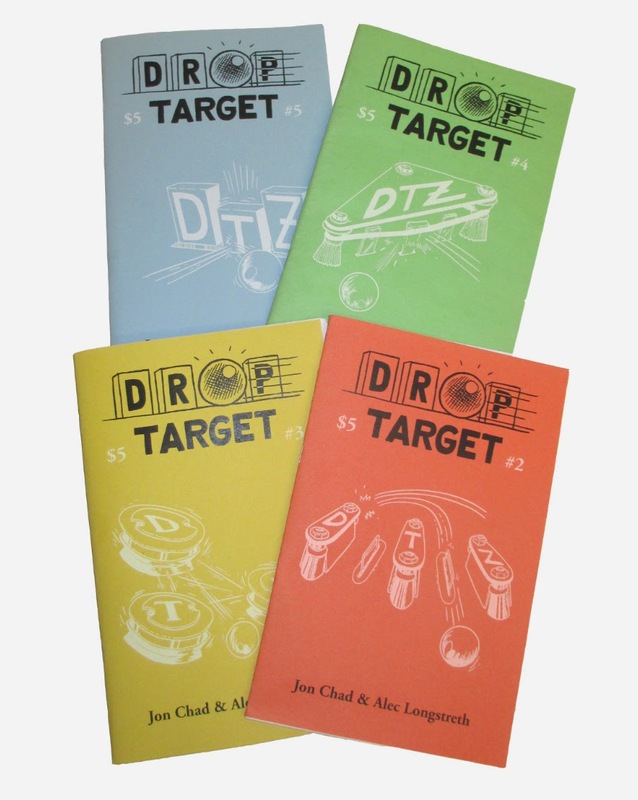 New Drop Target second printings!